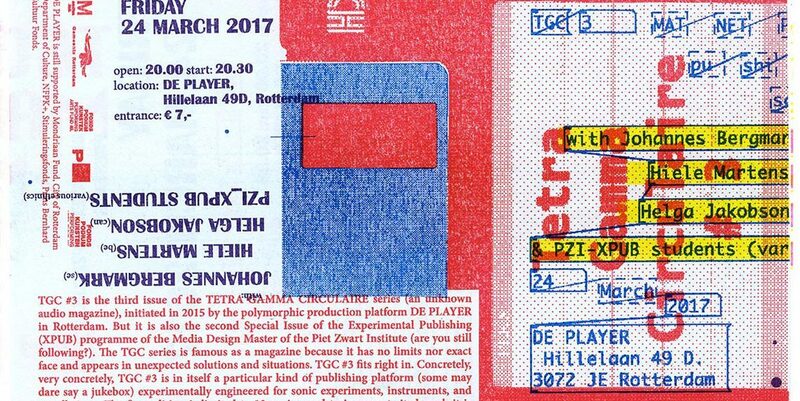 TGC #3 is the third issue of the TETRA GAMMA CIRCULAIRE series (an unknown audio magazine), initiated in 2015 by the polymorphic production platform DE PLAYER in Rotterdam. 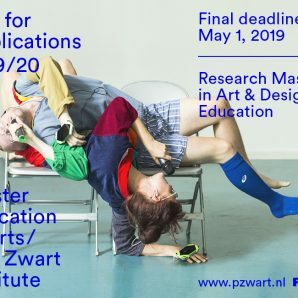 But it is also the second Special Issue of the Experimental Publishing (XPUB) programme of the Media Design Master of the Piet Zwart Institute (are you still following?). The TGC series is famous as a magazine because it has no limits nor exact face and appears in unexpected solutions and situations. TGC #3 fits right in. Concretely, very concretely, TGC #3 is in itself a particular kind of publishing platform (some may dare say a jukebox) experimentally engineered for sonic experiments, instruments, and installations. The first edition is limited to 12 copies, and to inaugurate its launch it is distributed with works created and compiled by the XPUB students.This evening, the new issue will be demonstrated in its dynamic applications and for the festivity we flew in some other nerdy sound makers and breakers. Sometimes the sum of 1 + 1 adds up to 3. But if you add up 2 of belgiumâ€™s finest composers and musicians, it adds up to an infinite number. Hiele Martens, or the unexpected collaboration of Lieven Martens Moana and Roman Hiele, produced last months the most challenging music we have heard since long. 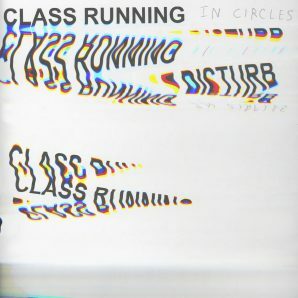 They delve deep into a new territory that can be a 2017 update of Maurice Kagelâ€™s Exotica, but for highly self-aware electronic musicians. You can expect their debut record release on Ultra Eczema as one of the highlights of upcoming year. Whether culminating into actions or objects, her work responds to conditions of limbo within existence and acts as a platform to confront the unknown; it focuses on death, time and ephemerality. Currently she is constructing a digital and physical web; weaving together the overlapping, intuitive and sometimes complicated interconnections that comprise my interest in handcraft, witchcraft, and digitalcraft. The main threads that run between these interests are the experience of women, their traditional work and their knowledge sharing. I have great reverence for intuition and itâ€™s use as a technology. For this event she will introduce and demonstrate her spider web record player. is a Fylkingen affiliated sound artist, instrument builder and piano technician. His performances have been described as surrealist puppet theatre, in which the characters are amplified objects such as old tools, kitchen utensils, toys, springs and decorative kitsch. Using contact microphones, Bergmark reveals their hidden acoustics, dynamic scales and unique timbres. Bergmark is the ultimate rethinker of what music can be, in sound and in performance, as you find him sometimes hanging on 2 piano strings from a ceiling. 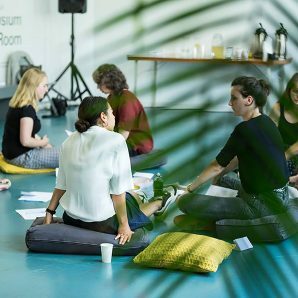 Experimental Publishing is a new course of the Piet Zwart Institute’s Media Design Master programme. 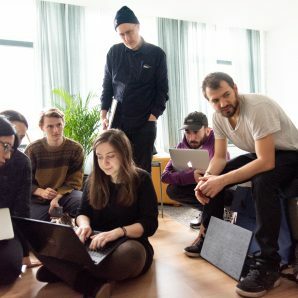 The concept of the course revolves around two core principles: first, the inquiry into the technological, political and cultural processes through which things are made public; and second, the desire to expand the notion of publishing beyond print media and its direct digital translation. The Experimental Publishing students who contributed to the development of TGC #3 are: Karina Dukalska, Max Franklin, Giulia de Giovanelli, Clàudia Giralt, Franc González, Margreet Riphagen, Nadine Rotem-Stibbe and Kimmy Spreeuwenberg.